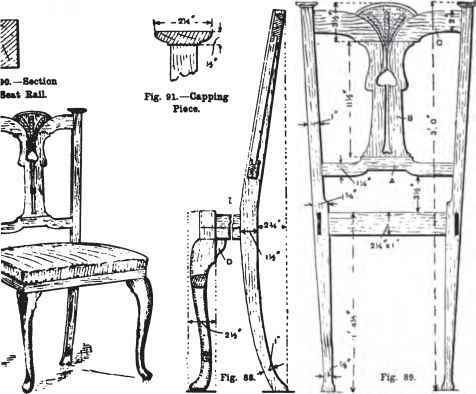 The small chair shown at Fig. 87 would go well with the armchair last described. A sectional elevation of the legs is given at Fig. 88, and an elevation of the back at Fig. 89. The back leg is If in. thick at the seat rail, tapering down to J in., and terminating in a bulb at the foot. From 1 in. above the seat rail the legs are reduced to 1 in. thick. The back legs slope from 1 ft. 4 in. apart at the top to 1 ft. at the floor. This necessitates the rails it is connected to the rails with tenons at the top and bottom, as shoi section at Fig. 88. The top rail c (Fig I in. thick, is ornamented with simple carving; it is mortised to th i in. in from the front, the same at stay rail. The moulded caps (Fig. Fig. 84.—Section of Upper Part of Back Leg. 81 and 82.— Sectional and Back Elevations of Dining-room Armchair. 84.—Section of Upper Part of Back Leg. 88 and 89. -Sectional and Back Elevations of Dining-room 8mall Chair. of the seat rails for the small chair, gives the sizes. The directions given Fig. $•"> for obtaining the bevels for ride rails, tenons, etc., of the armchair y equally to this case. 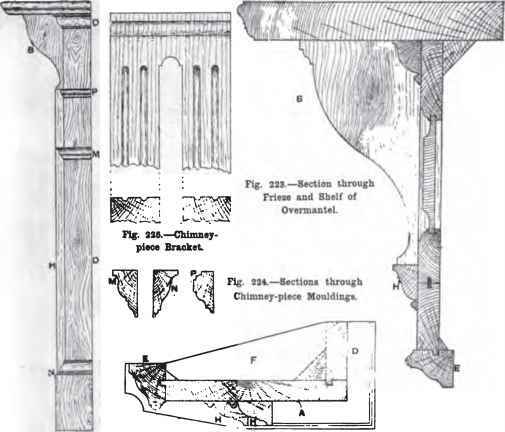 The clamps on leat rails (Fig. tH)) are kept flush with squares on the front legs, and the tea carried across the legs, after the ' is cramped up.